The Bokaap is under threat again, this time from a new 12-storey, 70-unit predominantly upper income development by BLOK developers. WHAT WILL THE PRACTICAL IMPACTS BE ON THE ADJACENT PROPERTIES AND THE WIDER AREA? WHAT ARE THE POTENTIAL SOCIAL AND CULTURAL IMPACTS? WHAT ARE THE KEY HERITAGE ISSUES? 1. WHERE IS THE PROPOSED DEVELOPMENT? The proposed building is at no 40 Lion Street, in the Bokaap, next door to St Monica’s Hospital. The erf number is erf 2970. Lion Street is a very narrow street of single and double-storey historic terraced houses and is on the upper edge of the Bokaap, right on the border of the Table Mountain National Park. 2. WHAT IS BEING PROPOSED? An application for a 12-storey apartment block with 55 apartments and with 110 parking bays with a square meterage of 4 255m2 was submitted to the City of Cape Town by the developers, BLOK. The submission is currently undergoing the approval process and IS NOT YET APPROVED. On 7 November 2017 residents of the area were informed that the developer was applying for departures to their original application and are requesting an additional 841.4m2 of space and a reduction by 43 onsite parking bays (these 43 vehicles will need to park in Lion Street, which will displace the current residents' parking) . This is an increase of 15 apartments to a new total of 70 apartments. The developers are motivating that the additional square meterage is for “affordable inclusionary housing”. The departure application has provided residents and concerned citizens with an opportunity to comment and object. 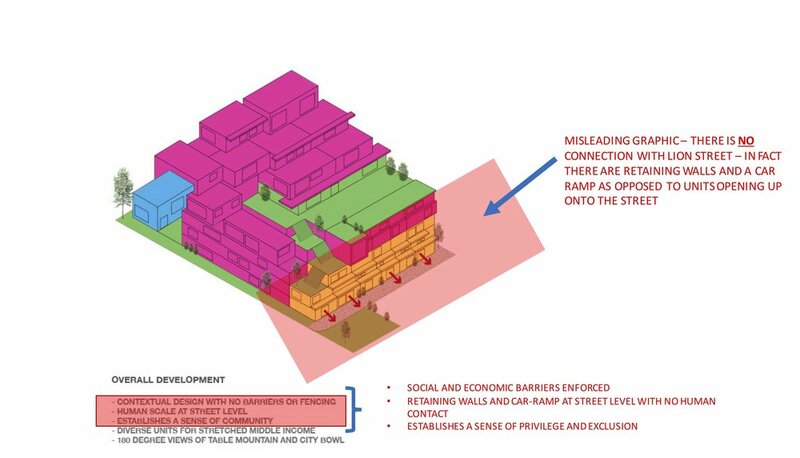 Image from Annexures provided by the developer to motivate their application to the City of Cape Town - the current proposal has retaining walls and a car ramp along the street edge. 3. What will the practical impacts be on the adjacent properties and the wider area? Congestion: The developer is applying for a departure from the zoning scheme to increase the number of apartments in their original application from 55 to 70, and at the same time reduce the number of onsite parking bays by 43. This means that there will be an additional 43 vehicles parking on Lion Street which is already extremely congested. 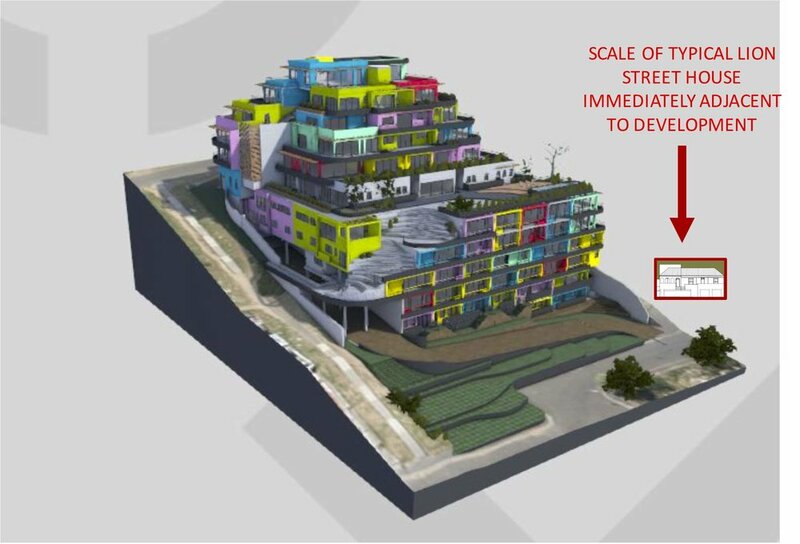 If the 70-unit development is approved in its entirety (together with the current departures), the residents of Lion, Bloem, Buiten, Whitford + Upper Buitengracht Streets (on top of the stone retaining wall), will have an additional 140 vehicles circulating through their narrow streets every day. Further, access to this part of the Bokaap is through an already congested SINGLE entry and exit point at Bloem Street. The roads infrastructure cannot cope. The 43 new cars that will need to be accommodated on Lion street - displacing existing residents' parking spaces. At present, the current residents compete for very limited spaces and will now have to walk far distances which may compromise their safety when returning home at night. Damage to old, cobbled roads: The old cobbles on the steep streets like Bloem Street may be destroyed by the additional traffic. Valuable heritage fabric will therefore be lost. Danger to school children attending St Pauls and Vista High: There are hundreds of school children arriving and leaving by taxi to St Pauls and Vista High every day. At school opening and closing times, the roads are jammed solid with taxis. The children walk in the road and cross the road unexpectedly. This development which will increase the number of the cars on these narrow and congested roads will put these children at risk. Danger to children playing in the street: In Bokaap the children play in the street. For generations, even very small children (3-5 years old) have raced around on their little “motorbikes”, children ride around on skateboards and teenagers play ball games. Local residents are fully aware of this and adjust their driving accordingly. It is doubtful whether the new residents (and in particular the short-term tenants - AirBnb) will be paying heed to the Bokaap’s children. Cape Town is suffering from the worst drought in recorded history and all climate change predictions are that this will be the new normal. Increasing pressure on an already severely stressed water infrastructure by an additional 70 households is untenable. In the developer's motivation there is no commitment to any water saving, water harvesting or grey water reticulation. The City of Cape Town as the custodians of our water infrastructure should urgently put in place emergency policies and legislation making water saving, water harvesting and grey water reticulation mandatory for all new developments in Cape Town. The proposed development may have a negative effect on pedestrians and surrounding buildings through wind impacts. Lion Street is very exposed to extreme South Easterly winds (it can be blowing 40 knots on Lion Street, yet be calm on Long Street). The excessively high building will most likely create increased turbulence at street level due to the barrier it places in the path of the wind. No wind studies have been presented by the developer. Safety in the Bokaap is enhanced through “eyes on the street” through residents spending time on their balconies and stoeps that characterise the Bokaap. This development undermines this special quality, in that the street edge is made up of high retaining walls and a car ramp. These walls are so high that they appear to line up with the roof eaves of the houses in Lion Street and will be very intimidating to pedestrians and residents. The developer needs to provide the public with accurate, surveyed contextual drawings to show the real impact of the building. Residents of the proposed development will look down into the back yards and private spaces of the residents of Lion Street, exacerbating the sense of social separation and invading privacy. The proposed development will overshadow surrounding buildings, leading to the loss of day light as well as compromising residents’ capacity to utilise solar energy particularly residents to the immediate south of the building. The height of this development must be significantly reduced to reduce the impact of overshadowing. 4. WHAT ARE THE POTENTIAL SOCIAL, CULTURAL AND ECONOMIC IMPACTS? The development seeks to “capitalise” on the character of Bokaap at the expense of the residents. The building does not attempt to integrate into the physical and social fabric of Bokaap. Rather, the interface with the street comprises imposing retaining walls and a car ramp, dividing the apartment dwellers from the community of the Bokaap. This retaining wall appears to be as high as the eaves of the adjoining houses. It is likely that the apartment dwellers will arrive and leave in their cars and have very little interaction with the community of the Bokaap. The development is designed to be an impenetrable fortress, putting up social barriers between existing residents and the newcomers. The developers' primary marketing angle for their development is that they are promoting “affordable inclusionary housing”, and that the 80% luxury apartments for the "wealthy 1%" will cross-subsidise the 20% of the apartments to ensure that middle income first time home buyers who earn between R15,000 – R30,000 a month can buy in at affordable levels. The developer motivates that this approach is only financially viable for them if the City allows them extra bulk over the current zoning scheme allowance, as a departure. This means extra square meters (15 more apartments) on top of the already over-scaled apartment block. This innovative financing approach could work well along development corridors identified in the City's densification policy or in other parts of the city, which are more suitable to these kinds of developments. The scale of this development is NOT suitable in historic Bokaap. The proposed development will have many negative social, cultural and economic impacts. The proposal includes 70 new dwelling units, a high number of new units relative to the social carrying capacity of this specific part of the Bokaap, as well as to the Bokaap as a whole. The target market for most of the units is for South Africa's 1% – apartments in this development range from R2,8m – R5,85m (see developer's website) (STATSA report from 2010 states that the minimum wage of the 1% in South Africa is R24,390 ). This is not the kind of housing that Cape Town needs more of, rather Cape Town desperately needs affordable, social housing. By allowing more of this kind of exclusive development at the scale and numbers proposed, the CoCT will increase the high levels of inequality that exist in our city and exacerbate pressing social issues. Further, this kind of development tends to attract speculative investment where people buy the units to rent out (often on Airbnb), and in this way have no personal investment in the area. The volume of numbers of proposed new dwelling units will thus exacerbate the already escalating gentrification trend in the Bo-Kaap. The proposal is not in accordance with the City of Cape Town’s Densification Policy. Densification is intended to make the city more equitable and to promote equal access to services, transportation and amenities, particularly for Cape Town’s less affluent citizens. As per the City of Cape Town’s policy, densification should not be promoted everywhere indiscriminately. It should be promoted only where it is contextually suitable and should follow the urban restructuring policy of densification along development corridors. This type of development is the type that exacerbates the current situation of a concentrated city centre. The proposed development will have a negative effect on the surrounding property values as it fundamentally undermines and erodes the historic charm of the area, along with all the reasons set out above. The aesthetic of the proposed development is more suited to the Atlantic seaboard than Lion Street with its historic Victorian cottages. The reference to the bright traditional Bo-Kaap colour palette on the building facade is not sufficient to integrate the building to its surroundings. 5. WHAT ARE THE KEY HERITAGE ISSUES ? The key heritage issues are that a building of this scale, nature and aesthetic should not be built in the historic Bo-Kaap. It is grossly over-scaled - 12 storeys in a 1 to 2 storey historic street of Victorian semi-detached cottages, has an alien urban form (terraced apartment block), is dead on the street edges (car ramp and retaining walls) and has a hostile aesthetic – more in keeping with luxury apartment blocks on the Atlantic sea board. The Bo-Kaap is recognised by South African Heritage Resource Agency as a “grade one resource”. This means it is a heritage resource of national significance and needs to be protected. Despite this, the 40 Lion Street development proposal is currently exempt from any comments or restrictions from the various Heritage bodies that protect historic urban fabric as the pending Heritage Protection Overlay Zone (HPOZ) that will legislate this protection of the Bo-Kaap has been stalled inside the City of Cape Town for almost 2 years. The only interest group that benefits from this delay are property developers. In the light of this delay, highly inappropriate and insensitive development is being bulldozed through the City, at great cost to Cape Town’s residents and future generations. This is not in the public interest. This development should be denied and we urgently call on the City of Cape Town as city custodians to put a moratorium on all developments in the Bo-Kaap until the HPOZ layer is finalised.